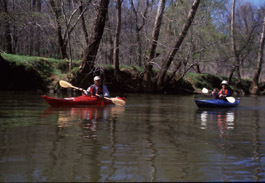 The Eno River Paddle Trips is a series of canoe trips on the Eno. Join Frog Hollow and Eno River Association as we explore the Eno River. Each month we will paddle a new section of the Eno River River from Hillsborough & Orange County through Durham until it’s end in Falls Lake. Over these various trips we will discover the hidden gem that is the Eno. Let your imagination go wild as you paddle past areas that used to be home to Shakori, Occaneechi, and Eno American Indians, check out 867′ Occoneechee Mountain, watch turtles sunbathe, and more! Register for these paddle trips at the Frog Hollow Outdoors website. **Please register here for this date. Paddling is a great way to explore the Eno River. Opportunities for both flatwater and whitewater paddling are available along the Eno. There are three flatwater sections of the river that maintain adequate river levels of between three and ten feet deep in all seasons. These quiet stretches of the Eno River provide the opportunity for gentle paddling, watching for wildlife and natural history meditation. West Point Point on the Eno Park – put in above the dam and paddle 3/4 mile upstream to the Sennett Hole. Dimmock’s Mill Dam – put in next to the bridge 1/4 mile up from the dam and paddle 1 mile upstream until water becomes too shallow. Eno Ramp at Fall’s of the Neuse Reservoir – put in at ramp and paddle (to the right) two miles upstream to the confluence with the Little River. You can also paddle two miles downstream (to the left) to the Flatt River and Knapp of Reeds Creek. In either direction you can easily paddle back to the boat ramp. Pleasant Green Access – is no longer an option for flatwater paddling. The dam was removed in spring 2006 because of safety and environmental concerns. The Eno River also provides an opportunity for whitewater paddling, but only after a period of significant rainfall. 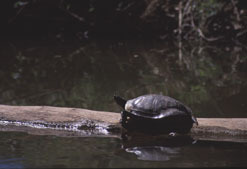 To enjoy paddling downstream requires an adequate water level. The best times are normally in the winter and spring. It is best to check the USGS streamflow websites before heading out (see the links below). Canoeing and Kayaking: Frog Hollow Outdoors is located in the Eno River basin and offers day trips, rentals and instruction for both kayaks and canoes. Individual and group rentals are available as well as cutomized excursions. For more information on Frog Hollow Outdoors, click here. The Frog Hollow outpost at West Point on the Eno offers hourly boat rentals, open on weekends during the summer. If you plan to paddle downstream there are several places where you can begin or end your Eno paddle trip. We’ve broken the Eno into six sections for access and description. We recommend that any trip have at least two boats for safety. In addition we encourage you to paddle safely–don’t overestimate your abilities or underestimate the strength of the current. Respect the power of the river. The length of the paddling trip for any section will vary substantially depending on water flow. The Eno River State Park has excellent information on paddling the Eno. Click here to visit their site. Click here to view A Virtual Canoe Trip See photos from a canoe expedition, from the Pleasant Green access to West Point on the Eno (sections 3 to 5 above). Bring water and an extra paddle. In cold weather wear appropriate clothing; don’t risk hypothermia. A river in flood is very dangerous–know the river and know your abilities. Only the launches in the State Park are routinely patrolled. Expect to spill, be prepared. The upstream side of your boat is safest. Hillsborough Quadrangle (Highway 70 bridge to Pleasant Green Road) scale, 6 inches equals 1 mile. Durham North Quadrangle (Guess Road to Old Oxford Highway) scale, 1 inch equals 1 mile. Orange and Durham Counties, scale 1 inch equals 2 miles. These maps are available from the Highway Commission in Raleigh or the District Office, Stadium Drive, Durham.